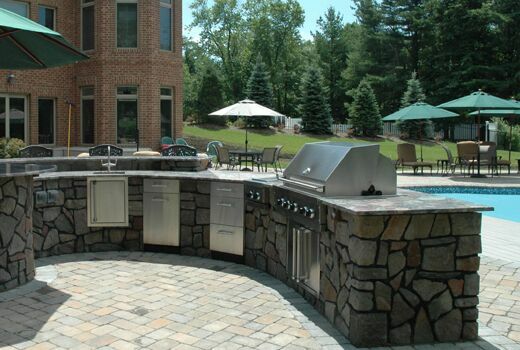 Do you find yourself asking: What do I want more…a custom outdoor bar or an outdoor kitchen? Well consider this. 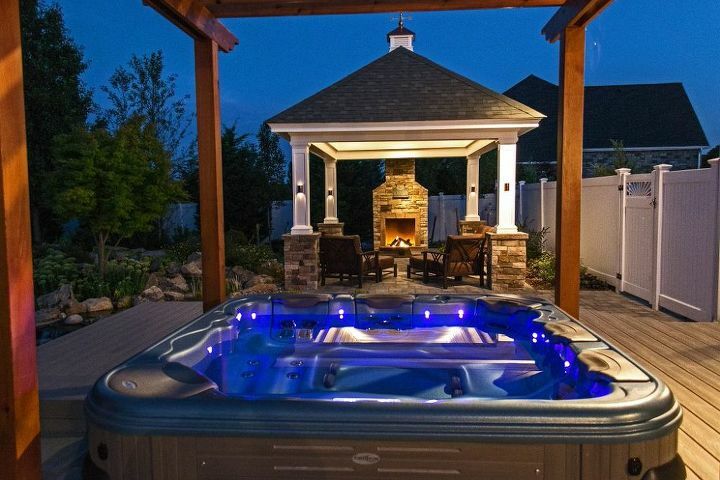 Why not combine these amenities in one handsome outdoor activity center. We’re talking about creating a custom area that is equal parts cooking, dining, and drinking spot. A fully equipped custom activity area allows the person doing the cooking to enjoy the company of family and friends in an outdoor setting. With everything needed close at hand, you no longer have to spend a lot of the fun time in a remote kitchen and then transport the meal outside. Consider our first example. 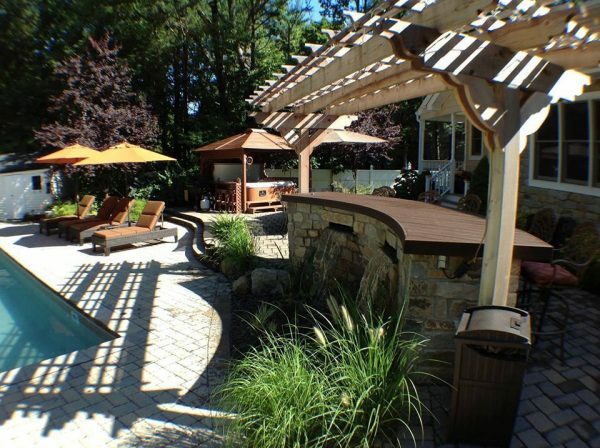 Deck and Patio created this outdoor kitchen/bar in much that way. The first step in planning any multi-purpose activity center is to pick a spot where much of the outdoor activities take place. Then you can design it the right size and shape to fit. 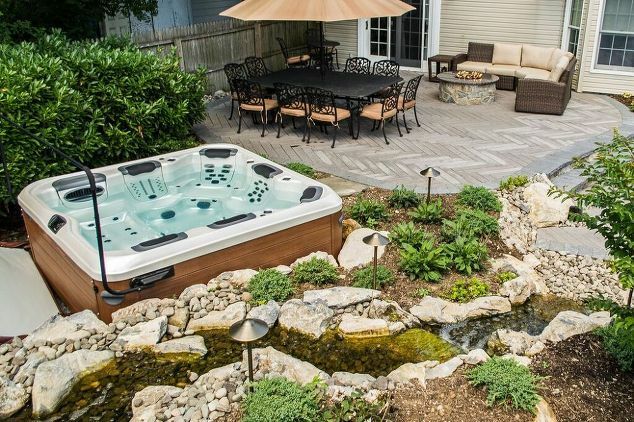 In this case, it was built on a new patio close to the pool and sun bathing parts of their yard. The design, which at one end includes a higher raised bar/dining area, incorporated lots of storage areas for bowls, cooking utensils, frequently used condiments, as well as a sink in the kitchen part of the activity center. Being such a fully equipped kitchen, there is less back and forth to the house, so it could be positioned further away from their indoor kitchen. 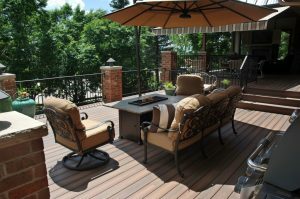 For this project, Deck and Patio constructed a custom activity area on the mid-level of a 3-level deck. 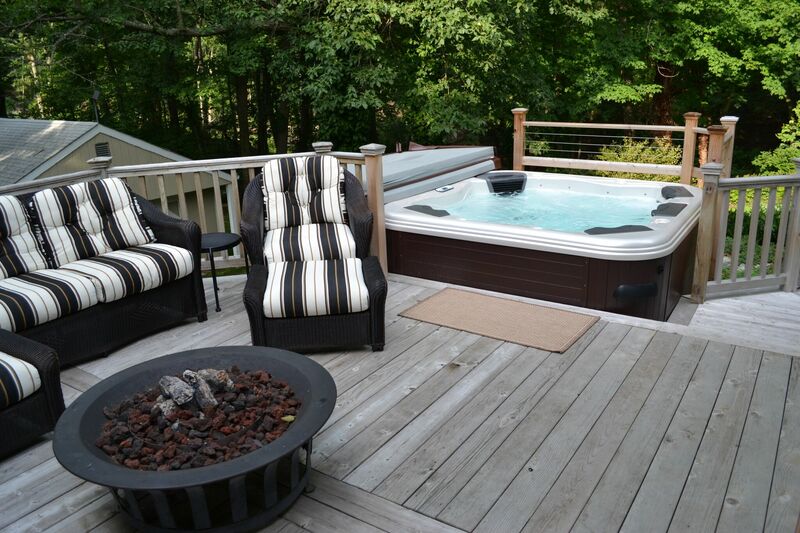 Just steps from the top-level’s large seating area, the custom outdoor kitchen/dining area includes a new grill, refrigerator, and even a smoker/cooker — all set within curved custom cabinetry with a raised bar that mimics the decking in style and design. A bar/dining area is a great place for guests and family to gather. In this case, it’s a truly peaceful spot since we installed a water feature with waterfalls next to their new portable hot tub. 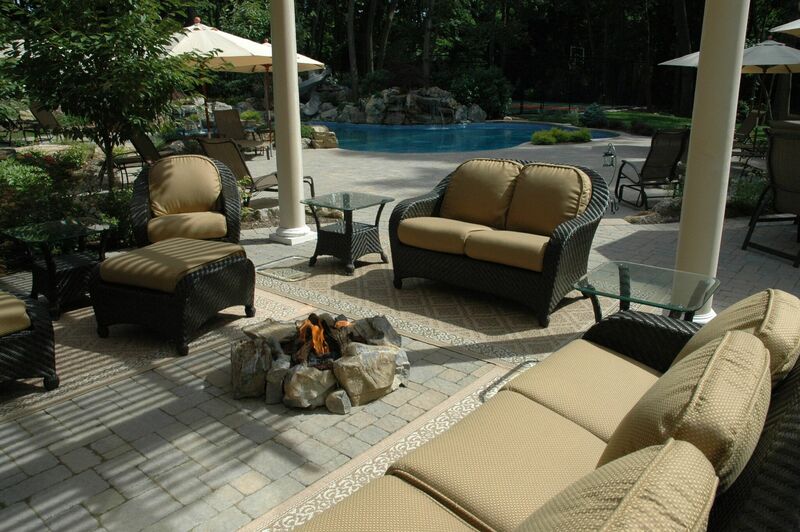 It creates a great atmosphere for conversation and enjoying an outdoor meal and drinks. 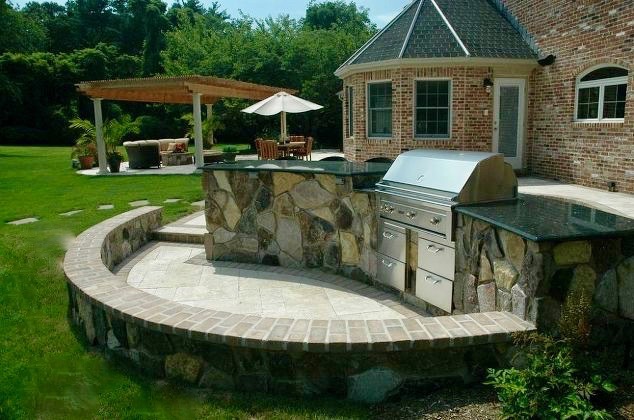 The bar and outdoor kitchen counter was constructed in a curved shape to mimic the patio design. It is granite topped and the base of the activity center is faced in natural stone. The lounging area’s outdoor umbrella is portable, allowing for flexible shade areas, including at the bar/kitchen. Deck and Patio again used natural stone for the veneer of this custom bar/barbecue activity center. We also constructed a seat wall made of the same veneer, with the same edge-restraint as the capstone for the seat wall. This created a unique design contrast between the patio lounge area and the kitchen/bar setting. It also allows for a extra seating space when there’s a crowd. 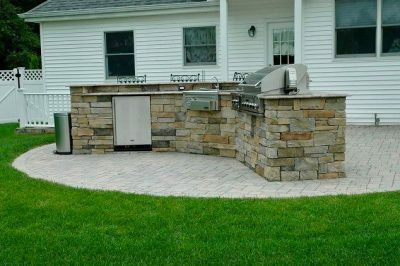 For easy dining and before and after cocktail hours, Deck and Patio created this handsome stone-faced outdoor kitchen with a raised bar. 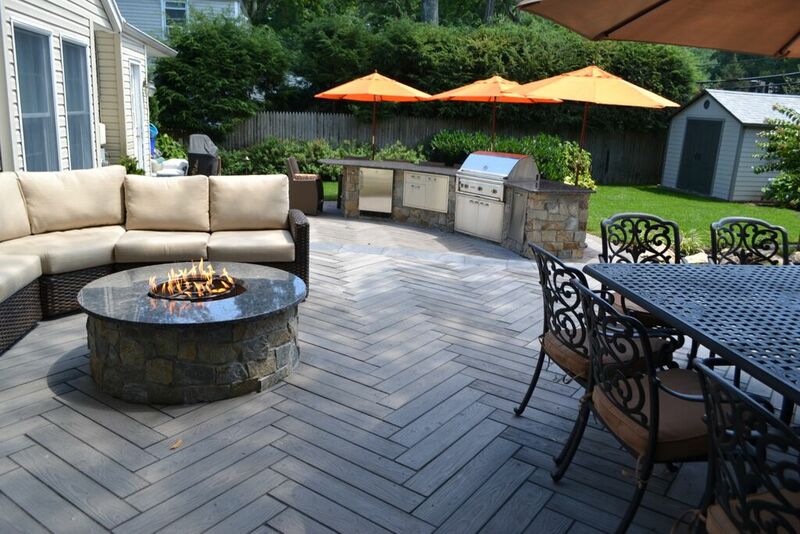 The patio paving stones underneath were chosen to stand up to a lot of traffic and weather changes, not to mention the heat from regular cooking on the grill. In addition, the custom outdoor kitchen’s appliances and cabinetry were chosen to last a long time. The lower level of this patio is made of the same Borealis’ modular slabs as the upper area. 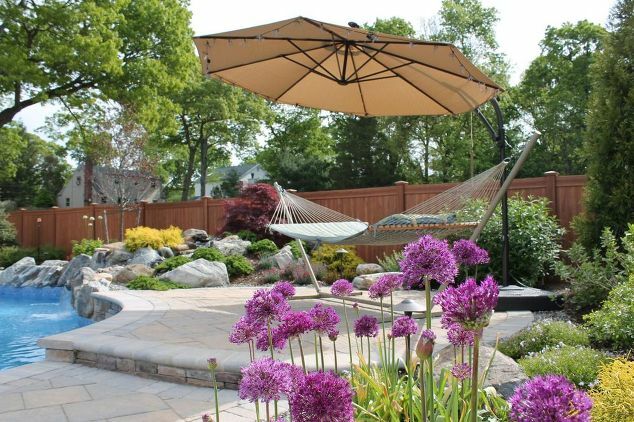 Space being at a premium here, the clients decided against a fixed pergola for shade, opting instead for more flexible outdoor umbrellas. The colorful umbrellas offer bright pops of color and can be set wherever they are needed, open or closed, depending on how much sun there is. 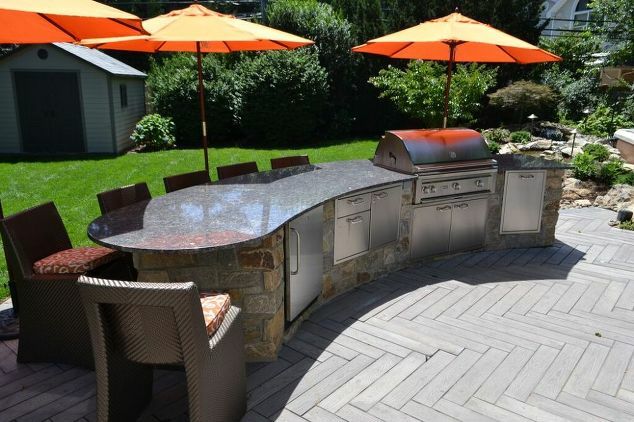 This Deck and Patio outdoor kitchen’s barbecue cabinet has a built-in stainless steel grill, an ample work area, sink, refrigerator and eating/drinking bar with bar stools. 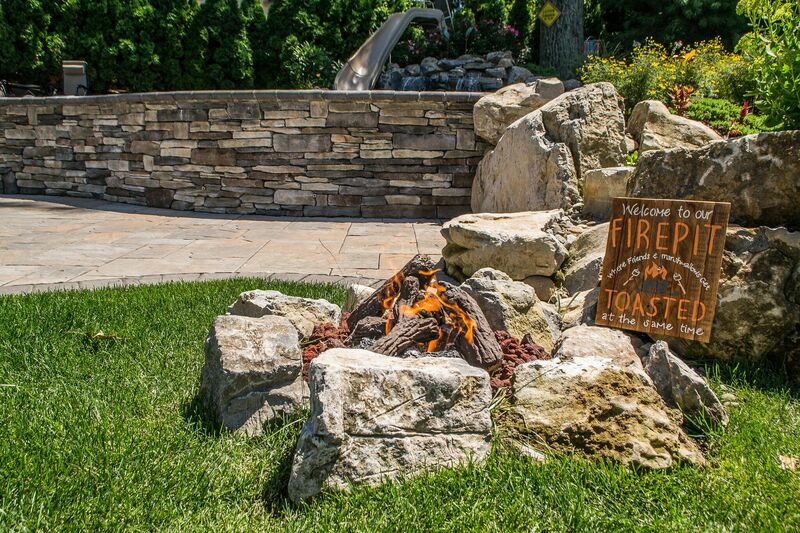 The natural stone facade of the activity center harmonizes nicely with the design of their new patio and mimics the facade around the custom fire pit. 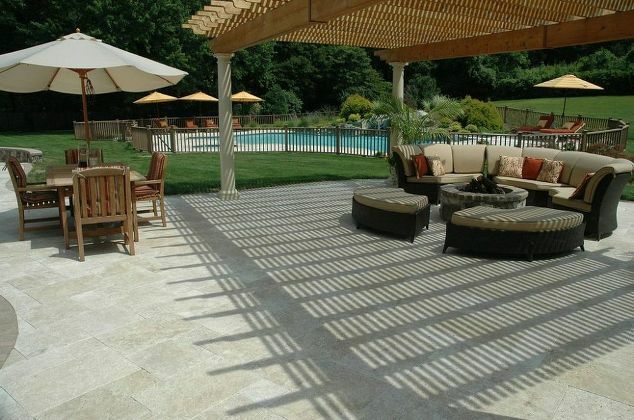 Again, flexible shade makes the outdoor bar/dining area a natural draw when the sun is strong. 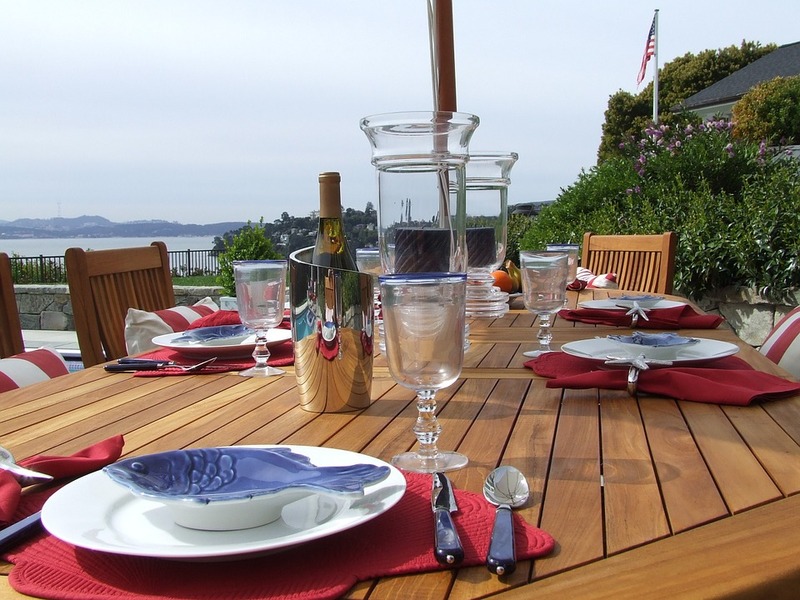 In Part II of ‘getting away to your deck,’ we’re sharing another fun and trendy outdoor activity: hosting a posh picnic. 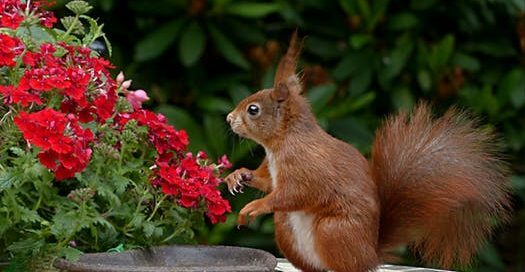 This outdoor dining experience is quite different from the sit-on-the-grass type of al fresco meal. 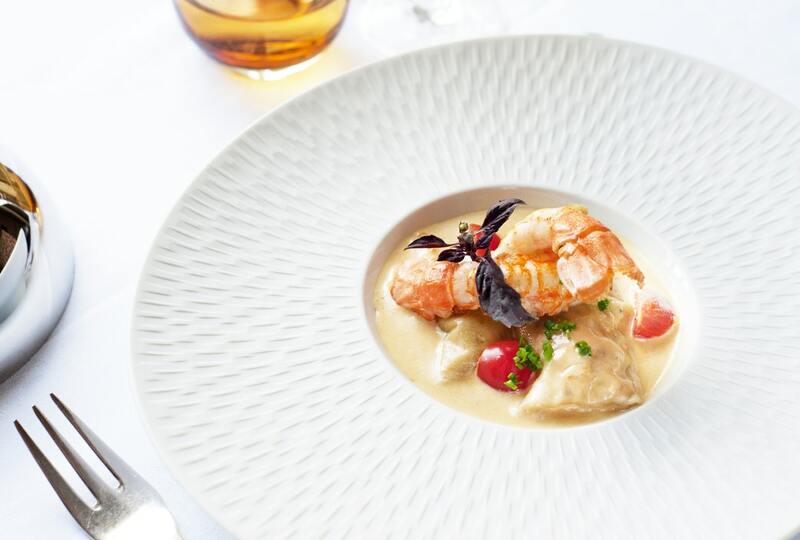 Most of the menu will be pre-made like a regular picnic, but it tends to be more gourmet and served à la fancy. 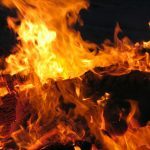 Most importantly, any outdoor dining chairs ensure there will be no sore backsides, or “numb bums” as in the case of picnics on a blanket on the ground. A posh picnic can be part of a ‘glamping’ weekend (see last week’s blog) or an event all of its own. Of course, it can be held away from home, but it’s a lot easier hosted right in your own yard and deck. It can also be catered. 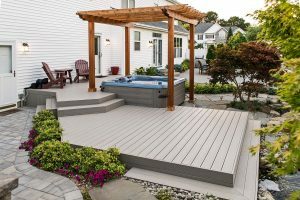 Even if you have a handsome deck (as all our Deck and Patio projects are of course…ahem), you can still consider some decorative flourishes. But before choosing them, you might want to begin with a theme. 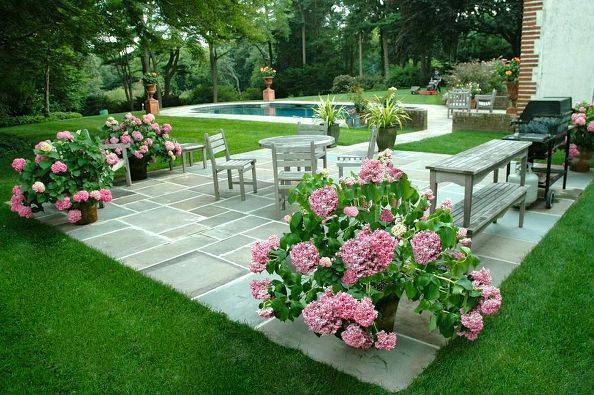 For example, you could host a ‘garden party picnic’ — where beautiful blooms take center stage. You could also include on your invitations what your guests should wear. 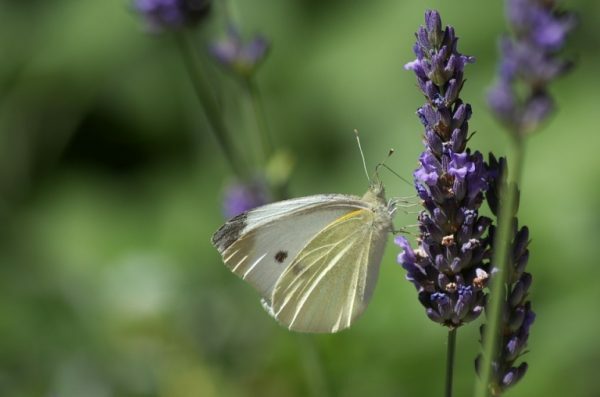 For example, you can host a cocktail hour on your patio before the picnic and pass around some finger foods like mini Caprese bites, or strawberry bruschetta or anything that might have come from your garden. For this kind of theme, ladies might be encouraged to wear clothing designed with florals. Next. 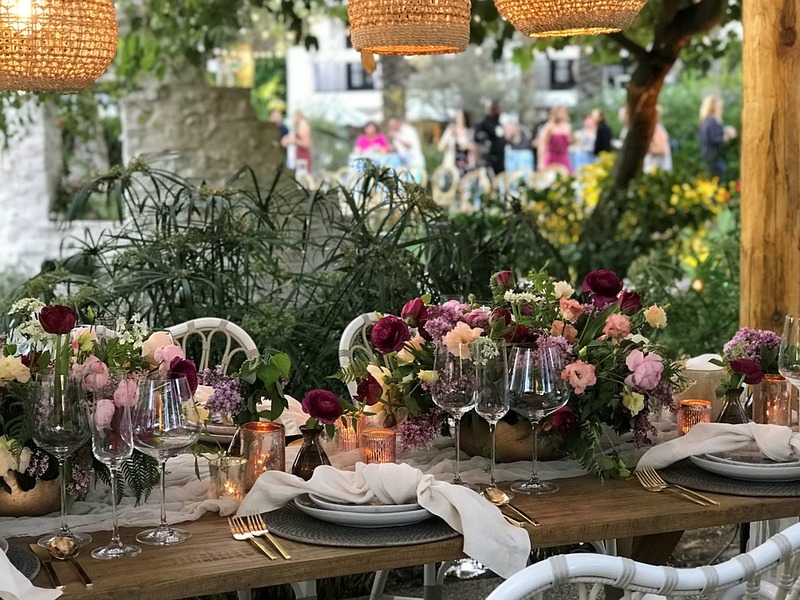 Besides a sturdy table, some sort of tablecloth is a must — perhaps white linen but something more colorful might suit you best. Also consider some crystal glasses, and, of course, at least a few pieces of fine china. 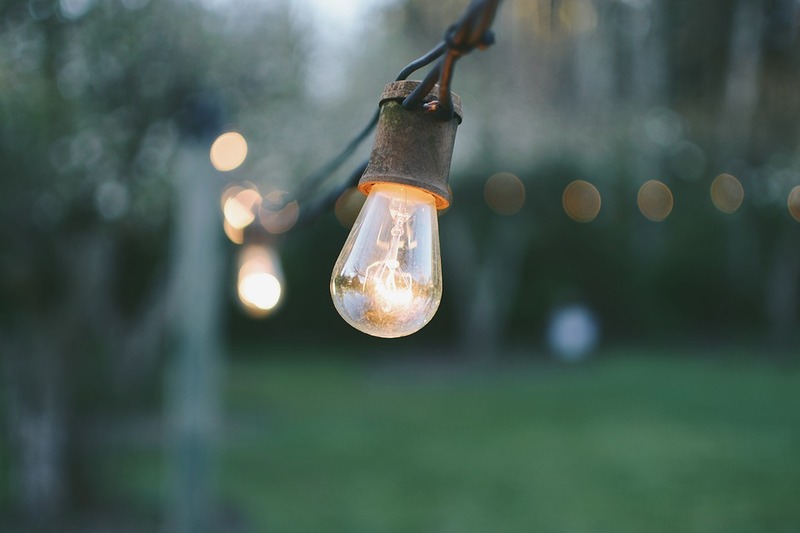 To finish glamming up your deck, add some attractive throw pillows to your picnic table benches or dining chairs, if they do not already have comfy cushions. And if you think the event will last into the evening, a few strings of lights and music will help keep the mood lively. 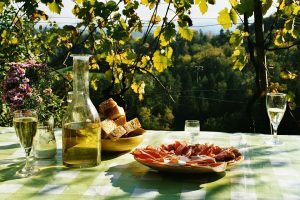 The basic idea for a posh picnic is: the breakfast, lunch or afternoon tea is primarily made up of pre-packaged or pre-cooked foods — in other words, this isn’t a barbecue. 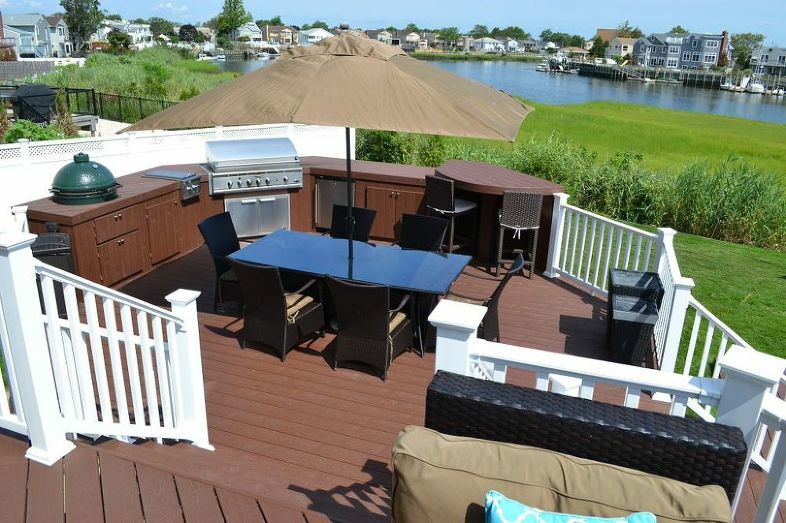 And because it’s on your deck, everything is just steps away in your kitchen. No concerns about transporting delicate foods in the warm summer weather. For appetizers, how about some prosciutto, cheese, white wine and aioli along with baskets of crusty bread. 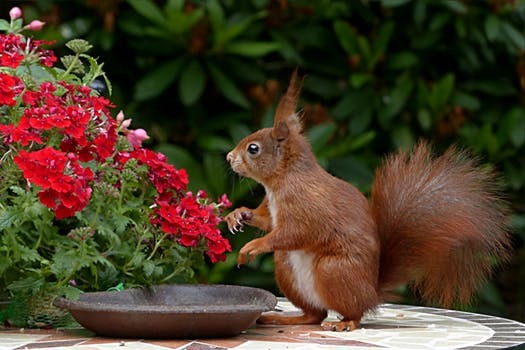 Maybe serve this with some pâté and olives. 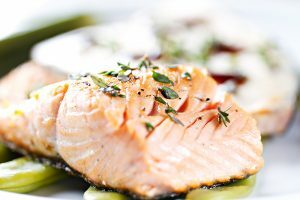 A relative once told me she was, “gourmet-impaired,” and some of your friends may also prefer simpler food. So, for an upscale menu that’s more tried and true, there’s nothing like cold fried chicken with coleslaw and potato salad. 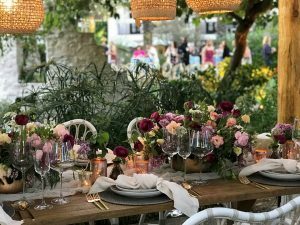 To ‘glamp’ these menu items up, just tie a pretty ribbon around tiered serving plates, or simply use decorative plates or bowls when serving them. 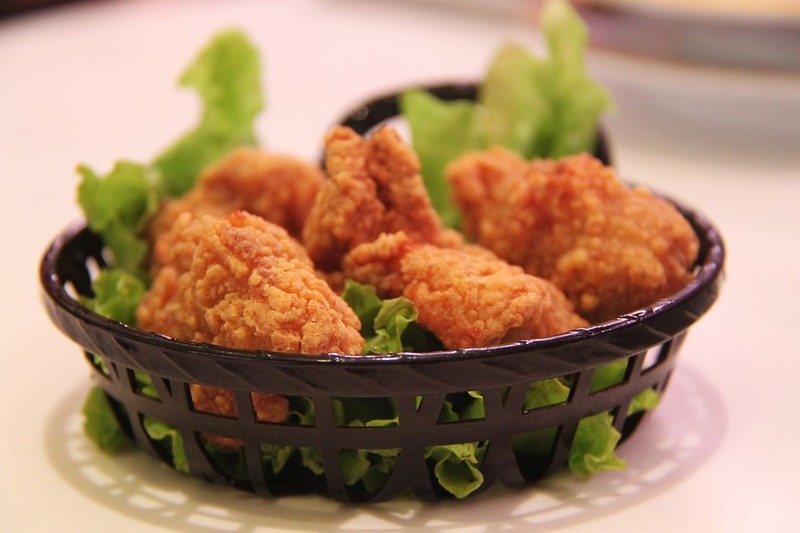 Frankly, we don’t know anyone who’d turn their nose up at crispy fried chicken and a glass of cold white wine. Grilled Ahi tuna, ready to be grabbed from your kitchen fridge when it’s time to serve, is one sophisticated choice. Another is cold salmon fillets. Either of these could be served with an idea we saw on Pinterest: roasted aubergine and lentil salad with mint and yoghurt dressing. Of course, you won’t go wrong with warm or cold lobster, served in a buttery broth or with some homemade mayonnaise, a rémoulade, or a béarnaise or hollandaise on the side for dipping. This crustacean doesn’t require much gilding, but a variety of salads would be nice. For cold lobster, maybe a potato salad of purple or multi-colored baby potatoes. And for dessert? A summer fruit salad and almond cake could be a crowd pleaser. Or a rich homemade brownie, or perhaps some mini meringues, or different colored French macarons (very different from macaroons). If your theme is a posh afternoon tea, the ideas are endless. Scones would be a must for this, with lots of fresh berries and cream — and, of course, some cucumber or poached salmon sandwiches. We believe you can even hire a butler to serve, if you wan to go the full Downton Abbey monty. One last suggestion. Don’t forget some filtered water along with the wine and/or champagne. So here’s to summer on your deck, 2018! 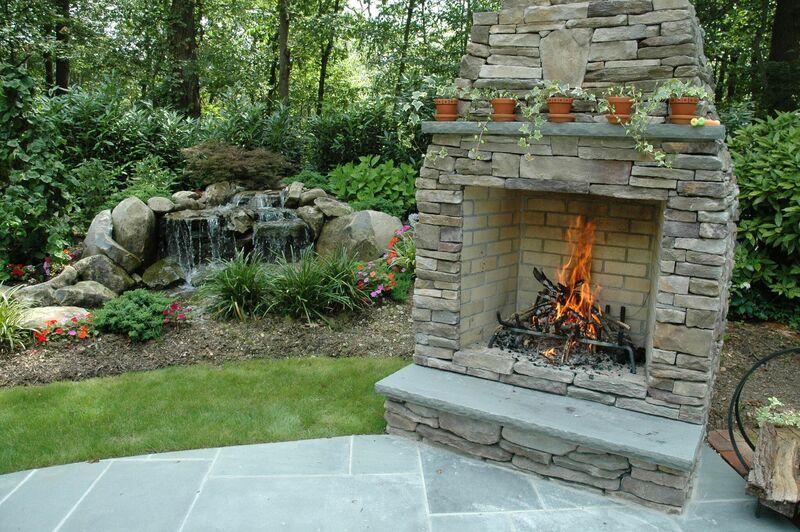 Memorial Day weekend (May 26-30) launches the year’s outdoor living season. And that includes lots of outdoor dining: family barbecues, picnics, dinner for the boss and his/her spouse, romantic dates, and just enjoying the air as we eat our take-out. “Many in our neck of the woods not only like to dine al fresco during the outdoor season, but they want to do that next to, or near, their own backyard pond,” says Dave Stockwell, owner of Deck and Patio. 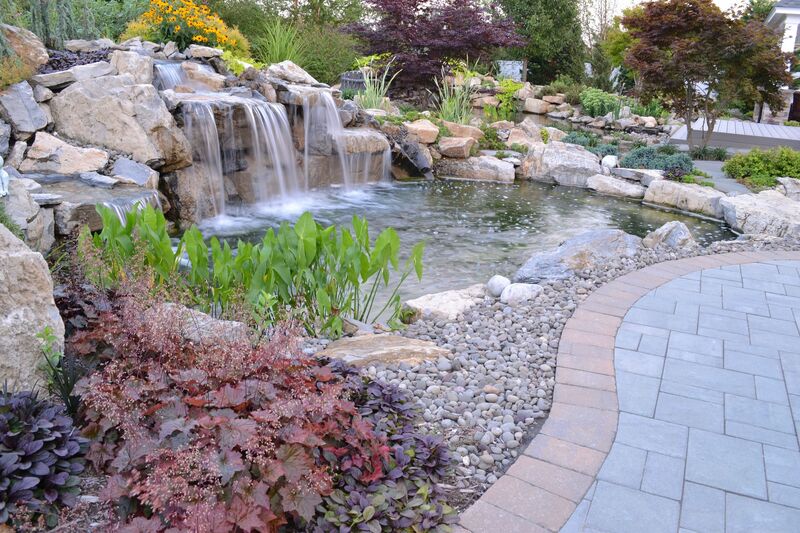 As Certified Contractors of Aquascape Inc. — one of the country’s leading manufacturers of pond and water feature products — Deck and Patio is able to stay informed and trained on all the latest techniques and technologies for ideal waterscapes. Indeed, on any given day, our teams can be found, in addition to other landscaping services, installing ponds, water gardens and other water features across Long Island and her environs. 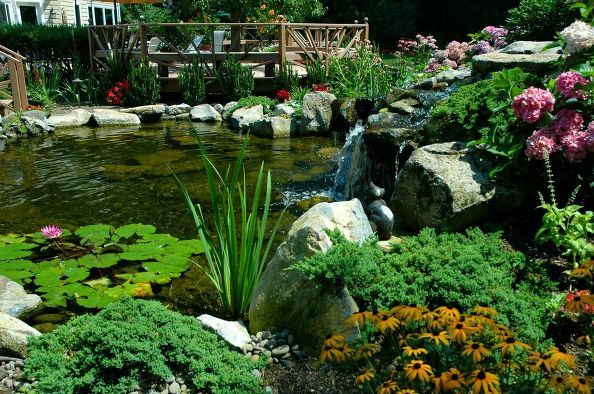 “The ponds we design/build can, for example, be completely eco-friendly and include rainwater harvesting; they can be landscaped with gorgeous water plants, stocked with pond fish, and aerated with waterfalls. Each project we do is as unique as the clients themselves,” says Dave. The one thing our ponds all have in common, adds Dave, is how much a backyard pond adds to each family’s outdoor experience. 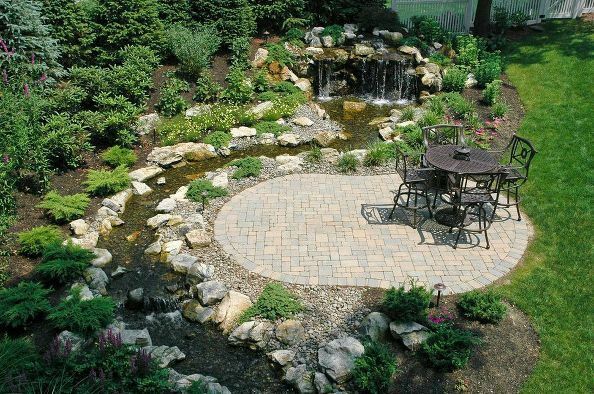 Having a water feature like a pond with waterfalls — with the sounds of moving water and natural beauty this provides — makes outdoor living and dining an exceptional experience. 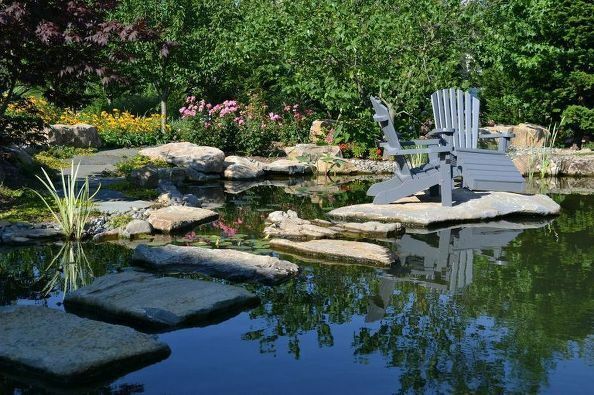 This pond project by Deck and Patio included a new deck with a viewing platform where the family can dine and enjoy the pond and its robust landscaping. 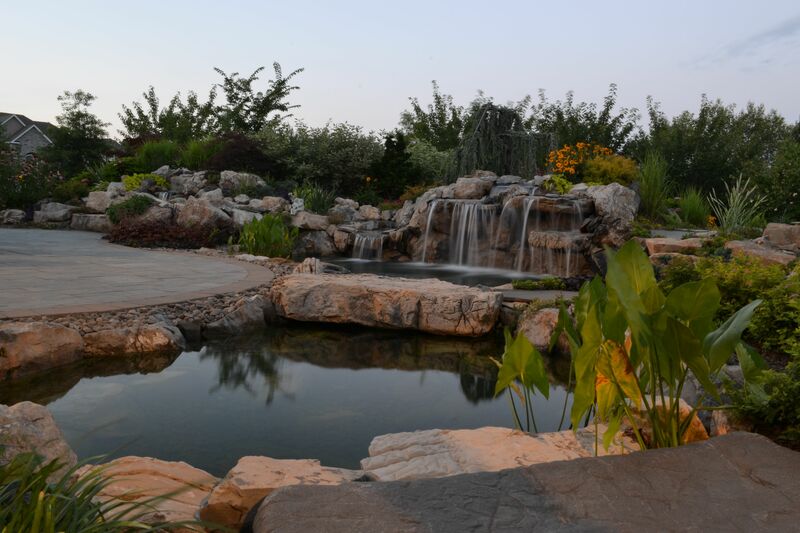 After dinner they can walk across a set of large stepping stones to view the pond from another vantage point. 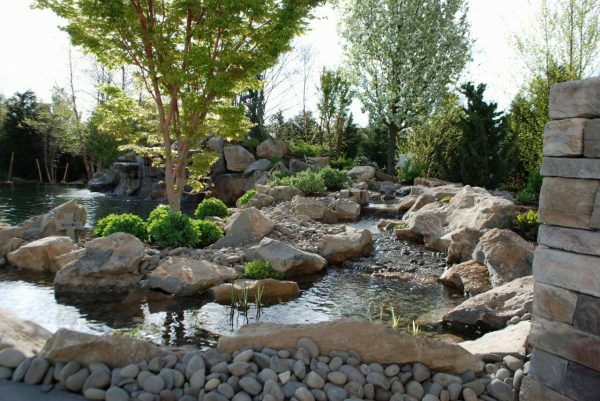 This photo, which is featured at the top of this page, was supplied to us by Aquascape Inc. 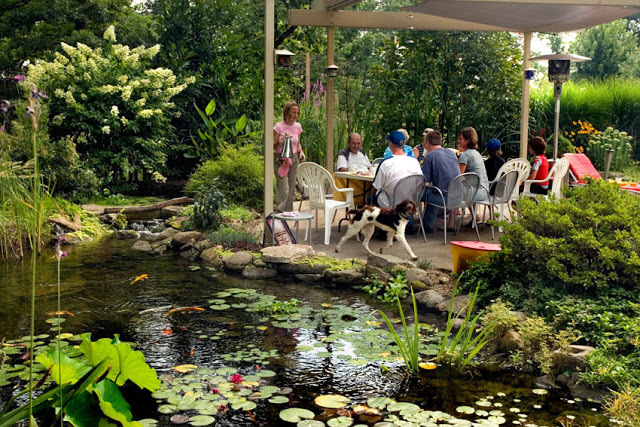 Here a group of family and friends — and even someone’s favorite pet —- enjoy a meal beside an exquisite pond stocked with koi. 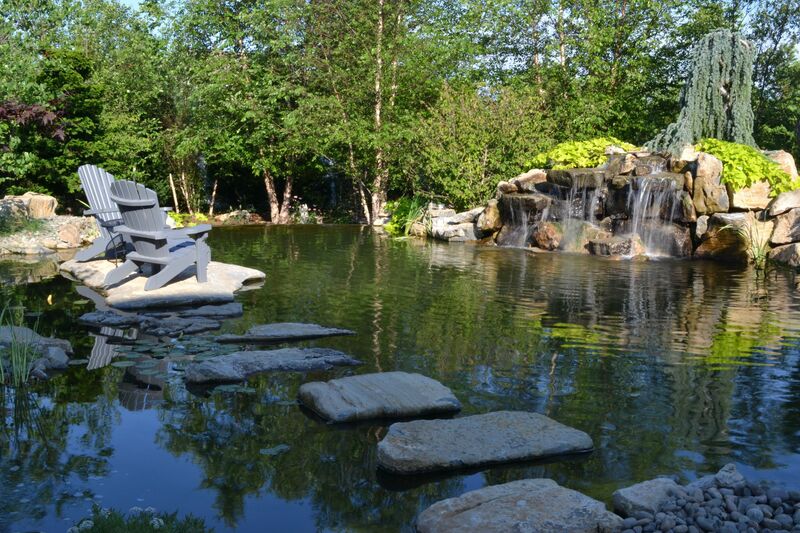 Soothing sounds from the waterfall help everyone relax and be at ease. Aquascape Inc. provided us with this photo of a charming dining area set on a deck with pond. Note how the wall mural picks up where the real plants leave off, giving a smallish water garden area the sense of natural expanse. 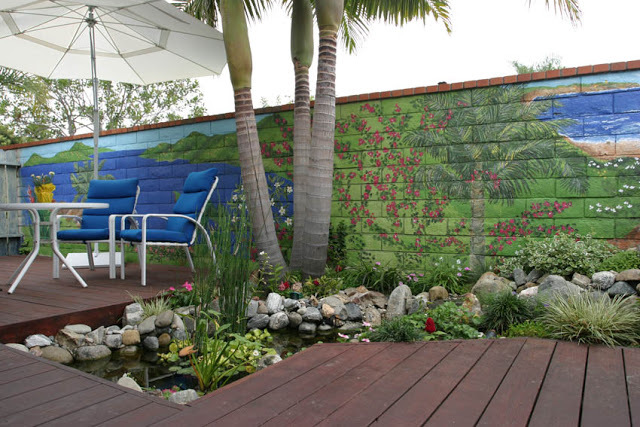 The homeowner also chose blue cushions to go with the mural’s water scenes, which helps to tie it all together. 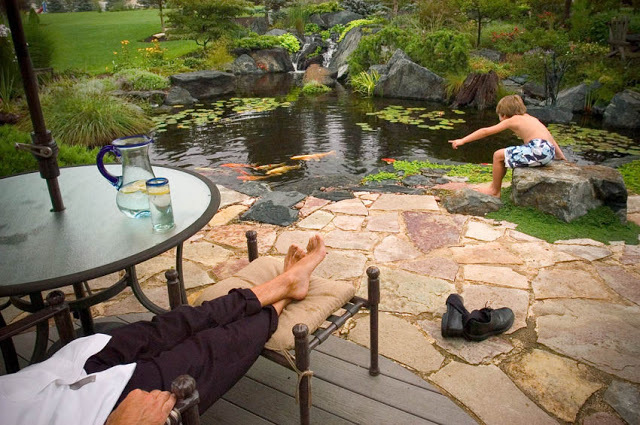 Yes, you can picnic “in” a pond. 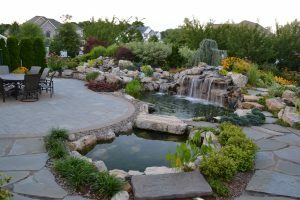 When Deck and Patio built this lovely pond water feature (which comprises two separate ponds next to each other), in the larger pond shown here there was space for a sizable stone island where the homeowners placed two Adirondack chairs. We installed stepping stones out to it adding to the overall Zen-like experience. They can go their island just for quiet contemplation; however, the chairs’ arms offer room for a small plate/box lunch and a cool drink. Thanks to Aquascape Inc. who supplied us with this photo as well. 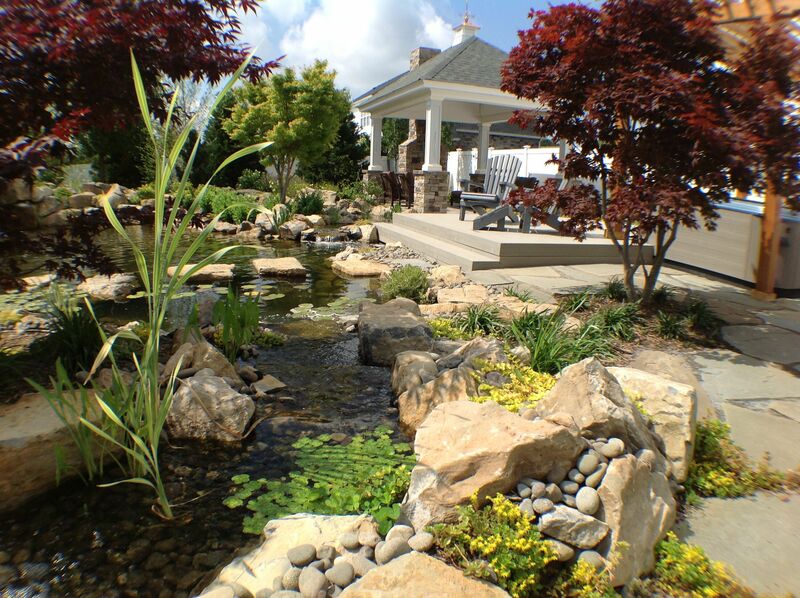 Imagine getting home from work, taking off your shoes and sipping some cool lemonade before dinner while the kids play by the pond? Yup, this is pretty much as good as it gets. 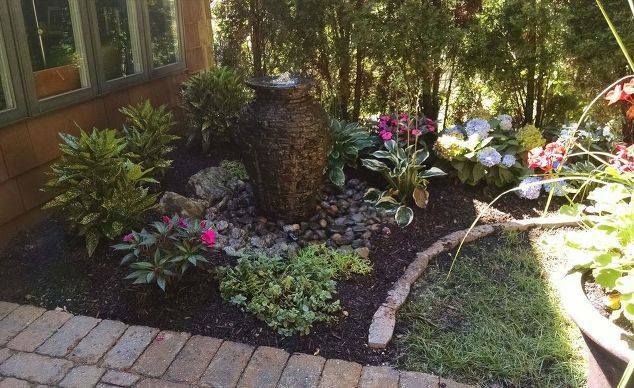 A big thank you to Aquascape for sharing some of today’s photos with us. 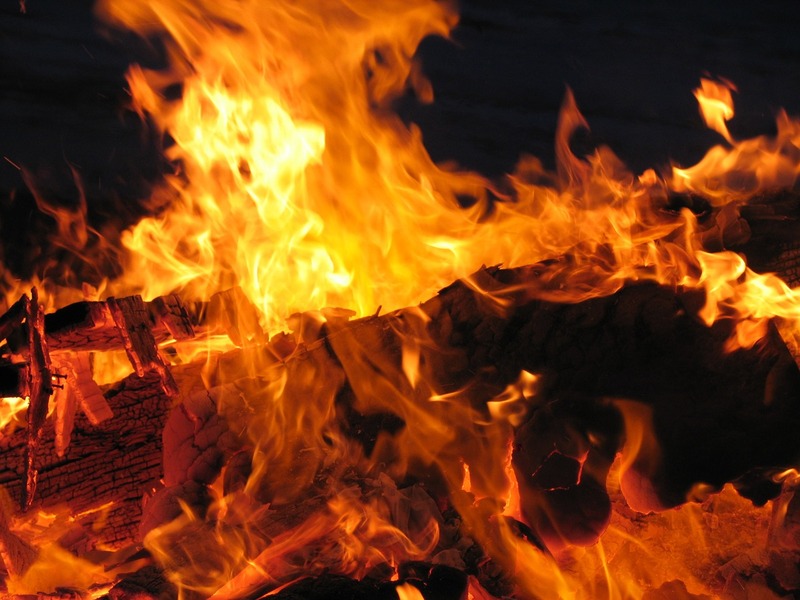 Camping trips and the rugged outdoor experiences they provide are fine in short bursts. But a full 5 or 6 month outdoor season spent enjoyed in one’s backyard cries out for comfortable and superbly functional amenities. 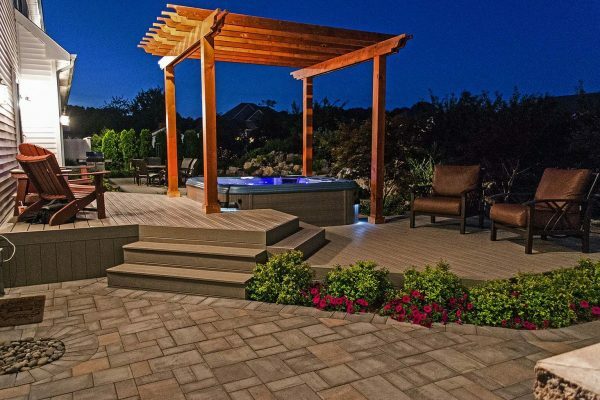 Today’s blog, however, will not focus so much on the key foundations of outdoor living — patios, decks, and large water features such as swimming pools — as the delightful amenities that enhance them. 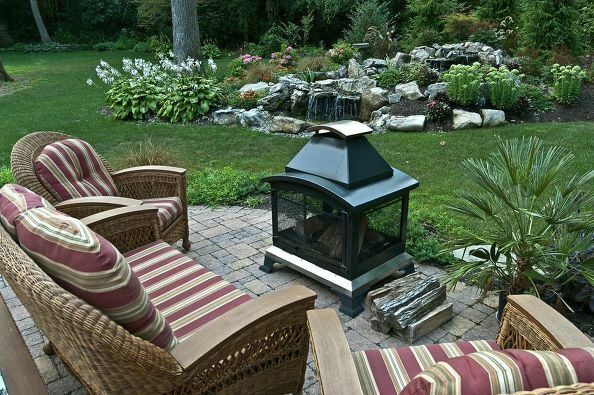 This first photo from Fiberon Decking, for example, highlights two opposite outdoor living enhancements — an attractive fire table that adds warmth on cool evenings and a shade umbrella that reduces the heat of the day. In addition, note how an awning provides even more relief from the sun on the upper deck level. 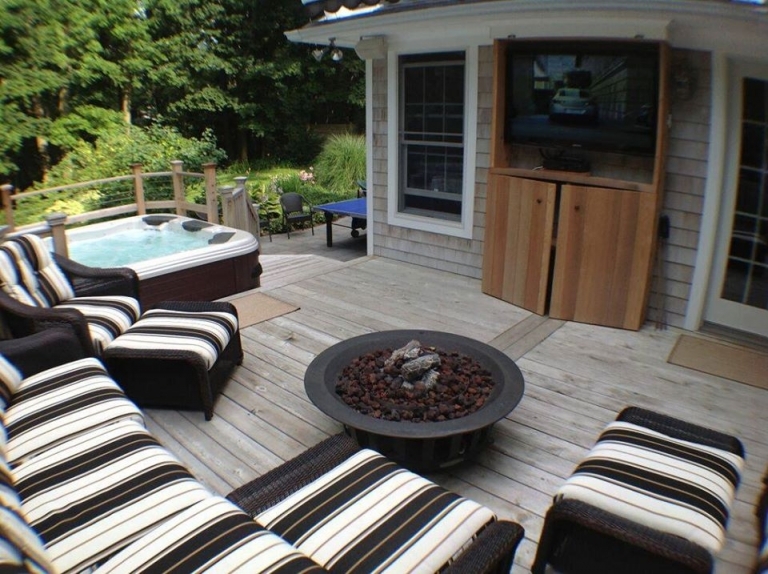 And very comfortable outdoor furniture means no sense at all of ‘camping out’ when sitting on this deck. 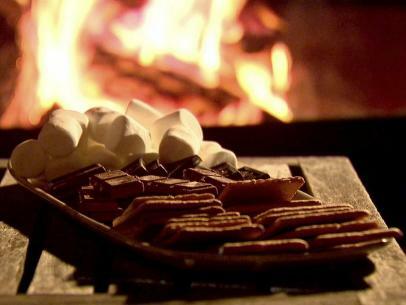 Plus a highly functional outdoor kitchen means no need to limit the dining experience — although marshmallows roasted over the fire table is one camping treat worth bringing home. 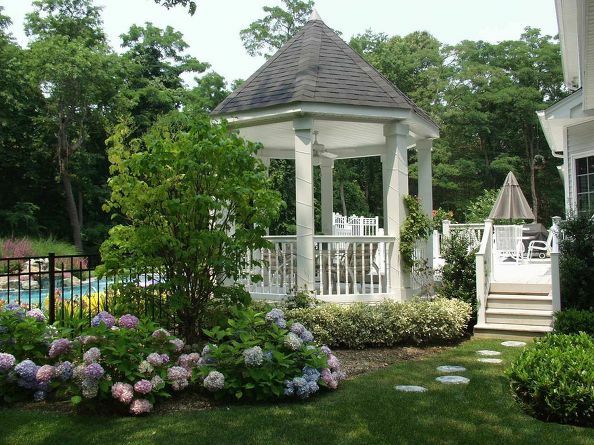 A garden gazebo is another wonderful amenity for providing shade and comfort. 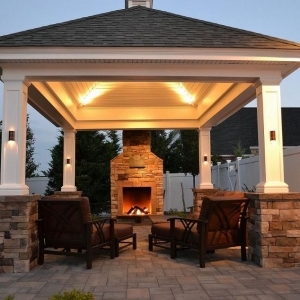 As architectural statements, gazebos are beautiful to the eye while providing shade, protection from rain, as well as comfortable seating. 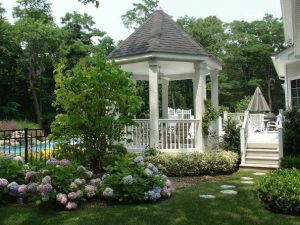 But a gazebo can be used in many more ways: as a meditation center; a spot for exercising; the ideal location for a hot tub; a venue for special celebrations like a wedding ceremony. 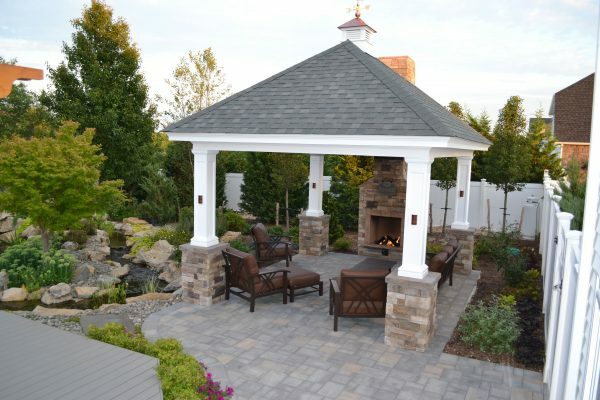 Indeed, we believe this gazebo, built at the edge of a new deck by Deck and Patio, would be a gorgeous location for a wedding. 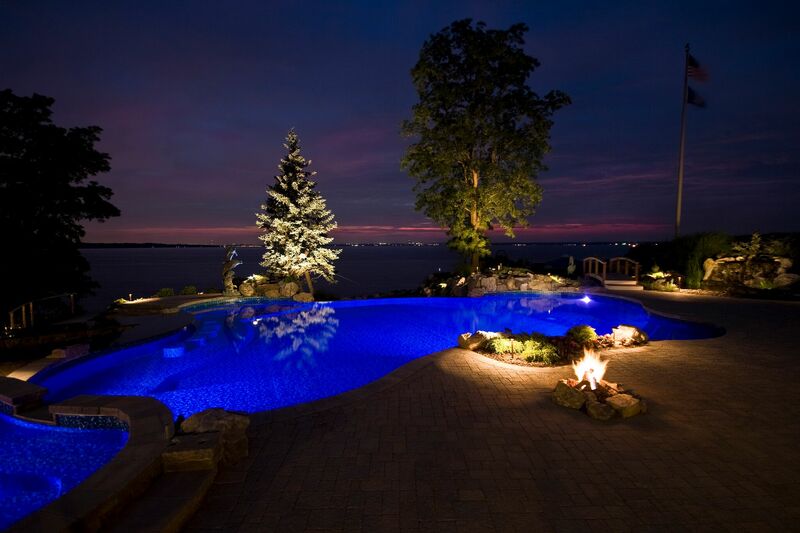 A reception held on this poolside deck would truly be memorable. 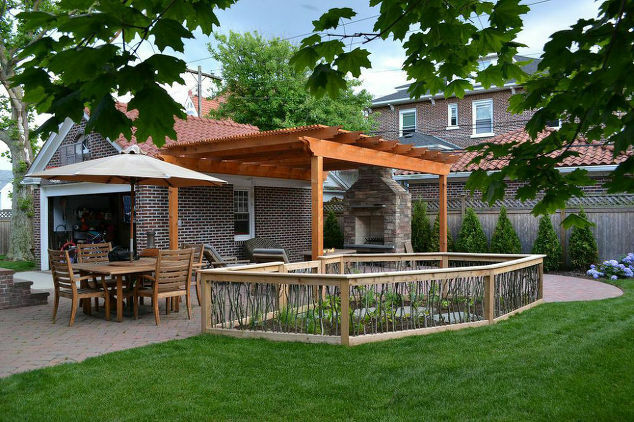 Trellises and pergolas also make dramatic architectural statements. They require less materials than a gazebo (or 4-season room) to construct, and provide limited shade with just support beams and rafters. 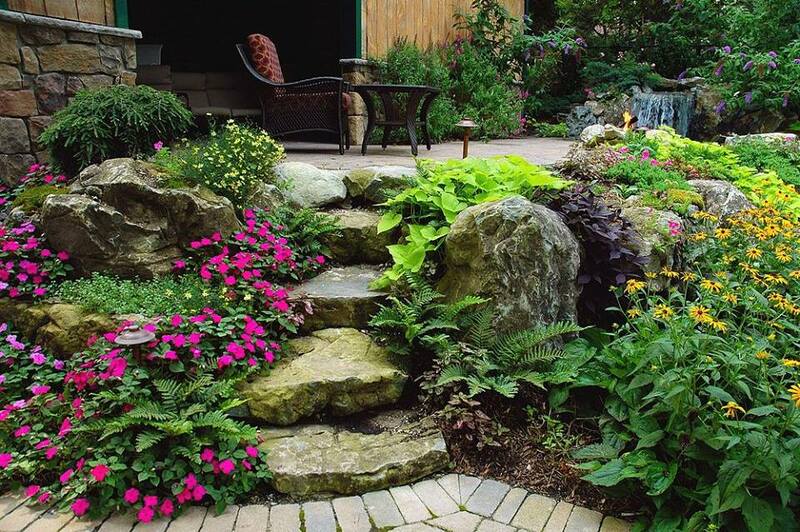 Taking the time to grow vines on a trellis/pergola, however, will eventually increase the amount of shade. 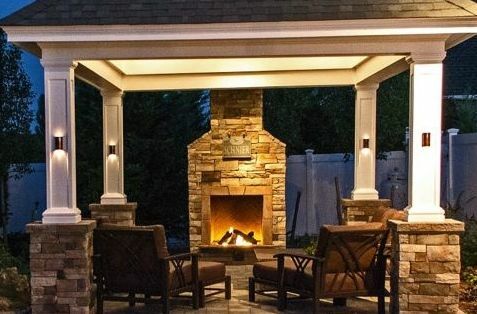 In the meantime, one can always add a canopy overhead — a good idea if the space underneath is used frequently when the sun is high. 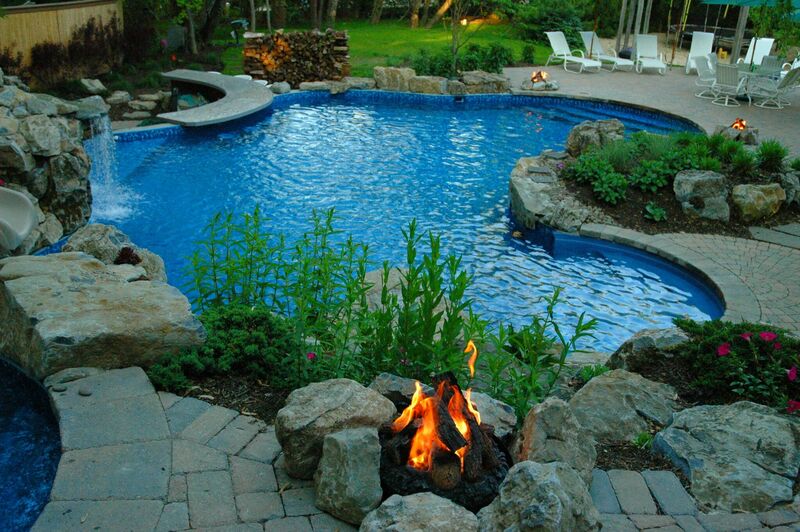 Swim-up bars turn a regular backyard pool into a full-blown resort. Looking at these two Deck and Patio projects, one can almost hear steel drums in the background, can’t you? Whenever a a swim-up bar is added to the pool, all that’s needed to complete a vacation-resort feeling are small drink umbrellas in the Mojitos and Piña Coladas. 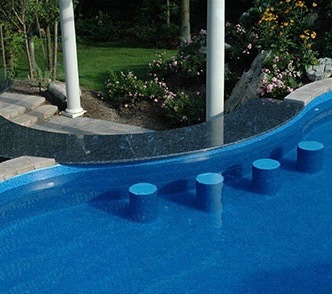 Deck and Patio not only designs in-pool submerged bar stools for swim-up bars, but we can design it all so this amenity can also be used as a dry bar, enjoyed on the other side. 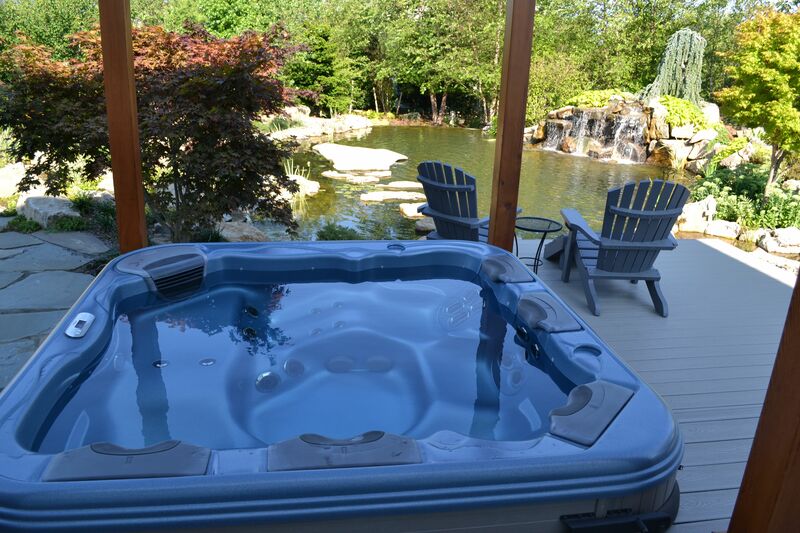 In-pool amenities that make a splash include waterfalls and jet sprays like those shown here. When either of these are added to a pool, their gentle sounds screen out in a delightful way any noise from the pool’s high-tech equipment and even nearby traffic. This Deck and Patio project also includes another outdoor living enhancement — an outdoor shower (not shown). 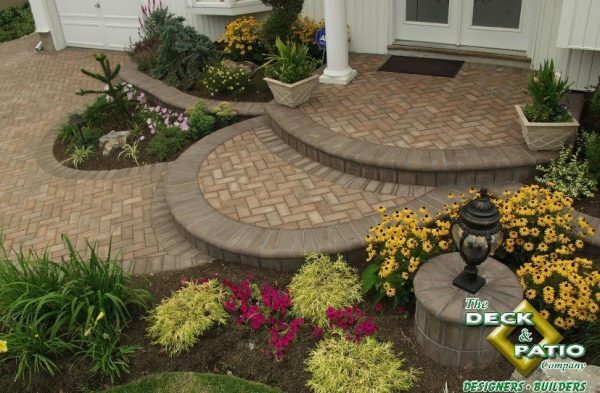 It is located at the base of a stepping stone path that leads up to the hidden pool equipment. Information about tanning shelves (a.k.a. Baja shelves, tanning ledges) seen above in this blog’s feature photo can be seen here.